Sophomore medical students Katherine Olivares and Guillermo Rodriguez represented the Wayne State University School of Medicine at the 2019 Latino Medical Student Association Regional Conference, held Feb. 1-2 at the University of Chicago's Pritzker School of Medicine. Olivares is president and Rodriguez is vice president of WSU's Amigos Medicos, a chapter of the Latino Medical Student Association, or LMSA. Although Amigos Medicos has been a student organization at WSU for many years, "This is only the second year the WSU School of Medicine had representatives at the conference, and we are coming to the end of our third year as an official chapter," Olivares said. "It was very encouraging to meet so many other students and faculty, beyond the ones we have here in Detroit, so determined in caring for our Latino patient population and establishing diversity within the medical field." The conference theme, "Únicos, Unidos y Orgullosos (Unique, United and Proud): Celebrating Diversity in Medicine," showcased LMSA as a student-driven organization focused on uniting a network of health care professionals determined to improve the quality of health care in Hispanic communities and serve as agents of change. 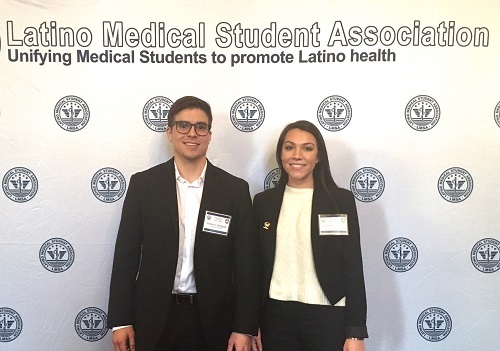 Olivares and Rodriguez voted for the LMSA Midwest 2019-2020 executive board, met Hispanic leaders in the medical field, and attended sessions on practicing cultural humility and concordant care, immigration reform and health care policy. Locally, Amigos Medicos works to improve the health of the Latino and Hispanic patient population through volunteering and cultivating members of the Wayne State University School of Medicine community to become better physicians for Latino and Hispanic populations. The group volunteers in southwest Detroit through several programs, including its own student-run clinic at All Saints Church on West Fort Street in Detroit. The All Saints Clinic is run by first-year students on Tuesdays and second-year students on Wednesdays, in a shared space with the church's soup kitchen and food pantry. Students provide patients with basic health assessments, blood sugar and blood pressure monitoring, health and community resource education and prescription refills under the guidance of a faculty physician. At Wayne, the organization hosts seminars and discussions for students about Latino health concerns, and teach Medical Spanish courses to WSU students and residents. "Beyond Guillermo and I attending this conference, I am really proud of the effort our organization has made this year to continue the example of the leaders before us and further develop and expand our programs in order to serve the Hispanic/Latino community of Detroit and make ourselves better physicians," Olivares added.